TimeOne – Native: our Content Discovery specialist is fully equipped to offer you overall support for your Native Advertising and Content Discovery strategies. 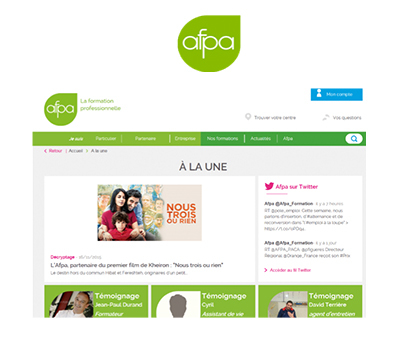 AFPA is the leading vocational training organisation offering diploma courses for adult job seekers and employees in France and Europe. Supply high-quality traffic to AFPA, generate engagement on the website and thus sustain the retargeting schemes. Response: delivery of contents (articles, forms and photos), creation of an intelligent internal network that interconnects contents and provides an initial idea of the user’s journey and engagement > support for the user in his/her journey prior to the commercial proposal. Contribution KPIs: pages viewed, account creations and training requests. 22,000 visits: average of 4 pages viewed, 7% of the traffic has participated in a request for training, increase in performance on retargeting schemes.